Adding an element of fun to technical work is a win-win strategy; not only will your piano students practice more, but they’ll also associate technical work with feelings of enjoyment and satisfaction. Our WunderKeys Visual Scale Packs are the perfect teaching tool when introducing scales to your young students. 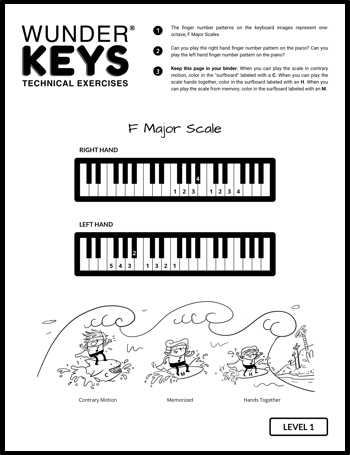 The visually appealing, easy-to-follow format means that scale practice will not be ignored when its time for your kids to hit the keys at home. Each of our Visual Scale Packs includes an element of fun as students interact with the printable to track their progress. Today, your students will ride the waves as they reinforce the major scales of F, Bb and Eb. Click on the image below to download today’s printable. You can find previous WunderKeys Visual Scale Packs here (C, G, D Major) and (A, E, B Major). If you’re enjoying the visual appeal WunderKeys brings to lesson materials, check out our Primer Level Method book. Your beginning students will love the colorful, engaging and helpful layout that makes home practice easy and accessible.